The University of Utah was recently designated as a Silver level Bicycle Friendly University. The League of American Bicyclists recognizes communities and universities that excel in five major areas: education, enforcement, engineering, encouragement and evaluation of cycling (the 5 E’s). The U of U was one of only two universities to receive the Silver award in this round and the only bike friendly campus award winner in Utah. There were many strong points in the U’s application including the new Bicycle Master Plan, the Bicycle Coordinator Position, and an active University Bike Committee. The U has had great success reducing bike theft with its Lock It or Lose It campaign. Bike use on campus continues to rise. 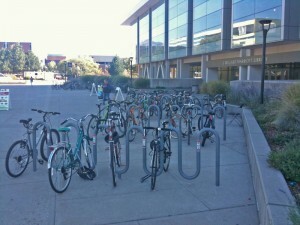 In the recent Salt Lake City bike count, some areas of campus saw a roughly 50% increase in bike use over 2011. The U also offers bike courses including bicycle maintenance classes in the spring through continuing education, and mountain bike classes and cycling classes through the Outdoor Rec Program. There is also an active chapter of the Bicycle Collective on campus (ubike.org). And, recently, the University installed several self-service bike fixit stations. The U also recently opened the HPER bikeway through central campus. Ample bike parking and several city routes facilitate commuting to campus. For the future, the University plans to expand bicycle parking areas, offer bicycle valets at more University events including football games, expand its bicycle rental program and further develop bicycle paths and routes, and engage riders with promotions and events. Additionally, Salt Lake City is planning new routes from downtown to campus over the next few months. To become involved with cycling efforts on campus contact [email protected] or visit the Universities Bike Facebook page (facebook.com/biketotheUofu).